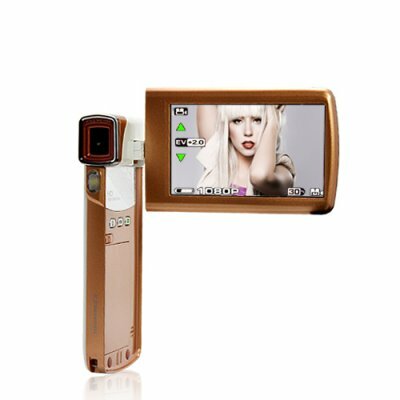 Successfully Added GaGa - Super Slim 1080P Video Camera with 3.0 Inch Touchscreen to your Shopping Cart. GaGa, the queen of 1080P video cameras, is back and more affordable than ever! Sporting a super slim style, it's the perfect camcorder to take with you when you recording the hottest fashion shows in Milan, Paris, and London! This 1080P HD camcorder also captures 30 frames per second (fps) video in amazing 1920 x 1080 resolution (1080P Full HD) and allows you to take 12MP digital photographs (4000 x 3000 pixels), which means "simply amazing" in less technical terms. This camcorder not only creates crystal clear and vibrant pictures and video, but does it in spectacular resolution that will look glorious on a plasma or LCD large screen TV. Capture live sporting events, the little one's unforgettable first times, and everything in between with this first class camcorder. Once you've captured the perfect video or photo, you can upload it directly to YouTube or Facebook using the advanced Internet Direct feature. All it takes is a few seconds of your time and a few clicks of your mouse, The intuitive menu system and controls makes operating this 1080P HD camcorder easy and convenient! Gaga...gorgeous! But the Gaga isn't just a cutting edge camcorder with a lot of performance thrown in, it's also a head-turning, delightfully designed video camera that borders on fan-fashion-tastic with its unique clamshell form factor, super-slim 17mm thin body, and a convenient fold-out 3.0 inch LCD touchscreen that swivels out for user interface and playback captured photos and videos. This beauty also has an AV output and HDMI slot for those demand connectivity. Symbolizing amazing performance and outstanding design architecture, the GaGa 1080P HD Camcorder is easy enough for the whole family to use and powerful enough to satisfy independent video producers. Available in our warehouse now, order today and we'll ship it out tomorrow! Brought to you by the leader in China Electronics - Chinavasion. Upload video and photos directly to YouTube or Facebook account!